A few months ago I flew to a leadership seminar in Chicago. Chicago was hammered by snow back in February (2013) but this made for an adventurous time. We don’t get that kind of snow in Dallas so it’s a nice change of pace. The biting wind was a little annoying but nothing a little deep-dish “thin” crust pizza couldn’t pacify. (And yes, deep dish and thin crust are quite the paradox but I avoided getting into a debate with my waitress). I always enjoy going new places and seeing new things but the fun all starts on the plane trip. My favorite part of flying is the rush of the plane taking off from the ground. Acceleration is such a beautiful thing to behold. Having coached world-class athletes for many years, the subject of speed is always near to my heart. Just recently I even had the opportunity to watch a friend (Olympic-caliber and world-ranked athlete) do a sprint analysis with Dr. Peter Weyand at his speed lab at SMU University. That level of speed is a thing of beauty…but I’m digressing. During my plane trip I just happened to have a new book on football speed in my lap when a young male cheerleader next to me starting asking how he could become more explosive. I love coaching people to achieve new successes so I didn’t hesitate to let him know how smart I (thought I) was. He graciously acted like he understood my explanation and then went back to his Drake cd. Another favorite part of the flight experience happens during stormy weather conditions. You can experience bad weather on the lower side of the clouds and instantly ascend above the clouds and experience beautiful panoramic views that can take your breath away. It always reminds me that we can often change our negative surroundings if we’re willing to change our vantage point or perspective. I spent two days experiencing extreme cold and snow. It wasn’t an abstract idea or thought. I could feel the frozen snow. My fingers experienced painful sensations when exposed to the icy winds while waiting for an available taxi to rescue us from the fast approaching evening and its lack of warm sunlight. I was excited to get back home and see my wife and daughter. However, in a matter of seconds my plane (window seat, of course) transported me to the exact opposite of cloudy, snowing conditions. Bright sunlight and blue skies were all around with no trace of snow or depressing conditions. I’ve often marveled at this idea: change the perspective and you often change the outcome. As humans, we can all attest to those moments when we felt like a rat running on an endless wheel. It seemed as though we would never reach a destination or resting point. Is our momentary misery really based in reality or our interpretation of the events we perceive around us? That’s a question I’ll leave you to wrestle with and ponder. For me, the change in scenery often serves as an impetus for paradigm shifts or re-evaluation of a current goal. Many people set goals for themselves that can often get derailed for a variety of reasons. Sometimes it’s a lack of information or techniques that prevents us from finishing. Sometimes there’s a lack of willpower to complete the task. Everyone knows what it feels like to have resistance when we decide to move or change something. One of the obvious keys to achievement in any area of your life is to have a well-marked destination or goal. However, you can create the best plan in the world and still fall short of that goal without assessing your progress. I have found that frequent self-assessments serve as gauges (empty/full; hot/cold) for personal success and achievement. Without assessment, goals and destinations become ambiguous, amorphous wanderings that can end in a stagnant season in one’s life. Weight loss is just one example. Although I’m not a fan of using scales, it does give a person (the appearance of) concrete evidence things are changing (weight loss). I prefer people using the “How-do-your-clothes-fit?” method of progress evaluation but that drives many impatient individuals crazy. Weight loss is of little value if you’re losing water rather than body fat. Scales can’t (accurately) tell you what kind of weight you’re losing. Lately I’ve been revisiting a book I read many years ago called Motivational Interviewing (2nd ed). Its focus is helping prepare people for successful change. Just this week I was coaching a counselor (paradox #2 of the weekend) who is seeking to make some personal changes but in the context of exploring his personality strengths/weaknesses. Over the years I’ve developed more of a comfort with the Myers-Briggs personality assessment as a coaching tool. Its usefulness and flexibility have helped me coach individuals who struggled through various relationship, vocational and/or health difficulties. I don’t use it to solve every problem because it’s simply a tool but it works well when you know how to implement it. 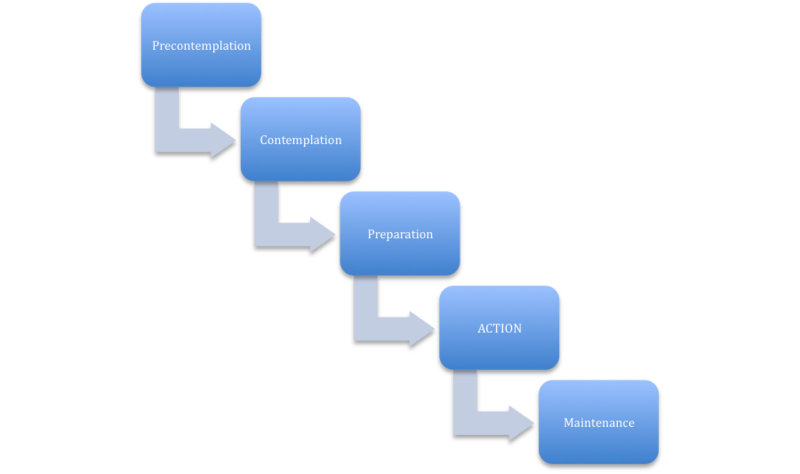 I’ll create a visual that allows you to see the progression from stage 1 (precontemplation) to stage 5 (maintenance). In his original work, Dr. Prochaska indicated a 6th stage called cessation but this has been modified because so much of what I encounter deals with things that should be ongoing (health modification, image improvement, spiritual pursuits, etc). Many of you reading this may be experiencing some difficulty in committing to an actual plan. I’d like to outline some strategies to help you reach your goals rather than simply dream about them as a possible outcome that could occur sometime in the future…how is that for ambiguous and open-ended? Step 1 – Define and clarify the problem, question or place of difficulty. Too much time is wasted when the REAL issue is not addressed. Step 2 – Create and implement a solution to the problem that concisely addresses the issues listed above. These will always set the stage for everything else. Step 3 – Once we’ve established a starting point and a proverbial conclusion (otherwise known as a goal), it’s time to delineate action measures to move forward towards this new vision. Step 4 – The framework has been set. Now, it’s time to create a support system. Anyone invested in personal change must realize that there is strength in numbers.